The Ketchum school campus contains two WPA built structures: A main classroom building and a Gymnasium. The main classroom building is an “L” shaped structure (80′ x 78’along the exterior walls) constructed from rusticated random ashlar masonry. It has a flat roof with parapets capped with concrete blocks. The front entryway consists of double doors with sidelights and transcoms. The entry is recessed, framed by pilasters and covered by a curved, preformed concrete awning which gives the structure allusions to modernesque form. The metal sash windows are grouped in triples with concrete sills and continous stone lintels. There is an inscribed concrete inset above the front entry. The Gymnasium is a rectangular building (92′ x 49′) constructed of randomly laid, uncut native stone. The gym has a stepped gabled roof. Windows on the gym have been filled with wood insets; awnings cover the windows on the classroom section of this complex. Pilasters frame the windows on this structure. Additions to both structures destroy their integrity and disqualify them for inclusion to the National Register. 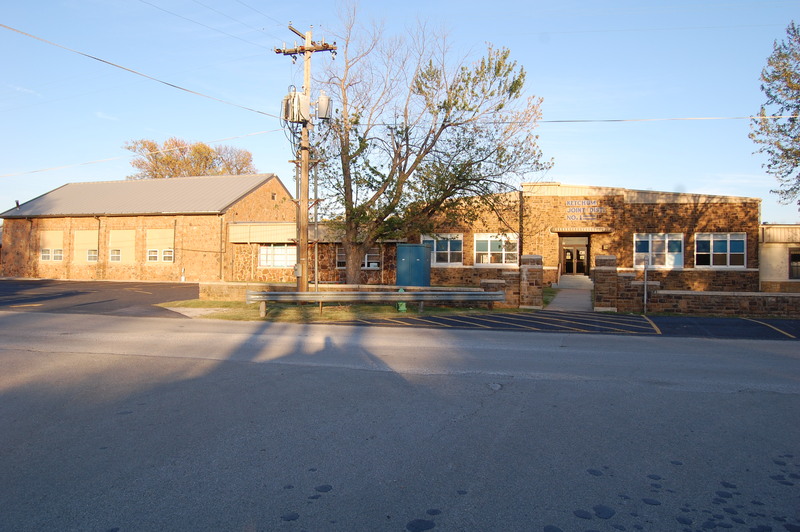 This school is significant because it constituted an economically important community resource. Its construction provided wages for local families (for some 31,000 man hours of labor) which were infused back into the depressed local economy. Jobs generated by the construction of the school restored a sense of pride to many men who might otherwise have been unable to provide for their families. The school served for many years as an educational facility for children of the community. The structures are also significant for their vernacular style which alludes to modernesque style on the main classroom building. VERBAL BOUNDARY DESCRIPTION: Situated on the northeast corner of the community, the school property begins at a point 624 feet north of the southwest corner of Sec. 25, T 24 N, R 21 E, and goes 312 feet east, 416 feet north, 312 feet west, and 416 feet south.